The La Harpe Historical and Genealogical Society has accumulated many interesting artifacts over the years, chronicling and preserving the surprisingly vast history our community and the surrounding area has encountered. 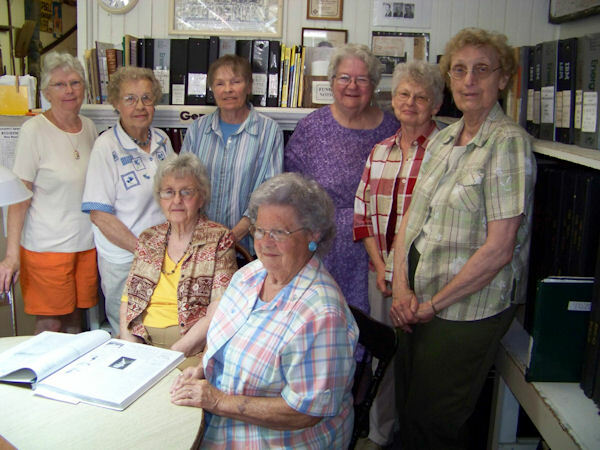 This group originated in 1987 and created the museum in 1989 across the street from its current location on Main Street, which they moved to in 1997. Within the museum, visitors can witness exhibits that are devoted to the likes of Abraham Lincoln's time spent in La Harpe, famous individuals like former soap star Olan Soule from "All My Children" and Charles Duryea, the man that alongside his brother was the first to manufacture the first gasoline powered automobile in 1893. Duryea was an 1882 graduate of La Harpe Gittings Seminary. Along with that, the museum hosts exhibits that show clips of advertisements that date back to almost 100 years ago, a historic look at the now deactivated La Harpe High School, a military and hospital area, a tribute to the old Webster Store, and many other sections that show what life was like in La Harpe during the early decades of La Harpe's existence. One of the most popular attractions is a model of what the town looked like in 1860. Many homes and buildings that were first to be erected in La Harpe in the mid-1800s still stand today. The oldest building in town is the home of Lois Bradshaw. It was built in 1844 and served as a school, then in 1878 became the St. James Catholic Church upon being sold to the Peoria Catholic Diocese. Sometime in the 1920s, the church was closed. In 1937, Harry Bradshaw bought the building and left it empty for the next eight years until Bill and Lois Bradshaw moved in with their two children. Many other locales in La Harpe were built around the same time the Bradshaw residence was, such as the La Harpe Methodist Church in 1849, the Union Church in 1854, and Dr. Steve Rodeffer's home in 1883. Amazingly, the oldest artifact that currently resides in the museum is a dress that dates back to 1845. Ada Hubbard of the La Harpe Historical and Genealogical Society did say that they have housed items older than that. An eplet from the War of 1812 was on loan in the museum earlier on in the military exhibit. 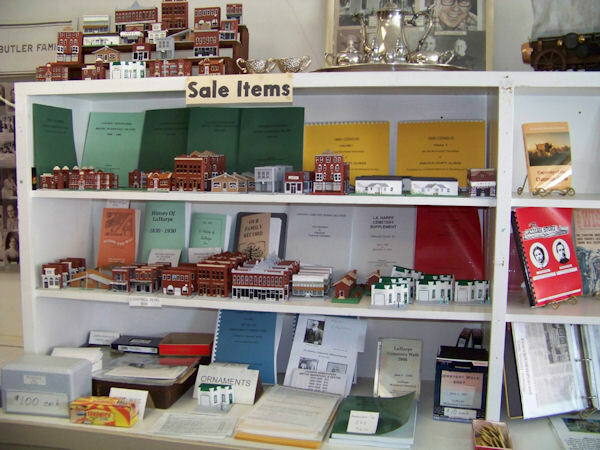 The La Harpe Historical and Genealogical Society generates their revenue from selling memberships to be a part of the group, as well as selling DVDs of the annual Cemetery Walks, books of Census information dating back to the 1800s, books containing records of births, deaths, and marriages, and more than likely their most popular item is the replica miniature buildings of businesses that have existed here in La Harpe. All of the buildings are sold for $5 except for the J.M. Campbell Building, which can be purchased for $8. Along with the J.M. Campbell Building, visitors can purchase replicas of the La Harpe Community Club House, La Harpe City Hall, the La Harpe Carnegie Library, the Amus-U Theater, the La Harpe Grade School and High Schools, and many other buildings that have contributed to the historical value of La Harpe. The most recent addition to this collection was the old Sinclair Station, complete with gas pumps and a sign. Hubbard stated the idea for the release of a new miniature building will be unveiled in January of 2009. These buildings are a great way to help the La Harpe Historical and Genealogical Society make a difference in the community, as they take some of the model buildings to the La Harpe-Davier Nursing Home and re-live the past by talking about memories they have of the businesses. The next major event the La Harpe Historical and Genealogical Society plans to hold is a reenactment of Abraham Lincoln's 1858 speech at the La Harpe Methodist Church. Tea will be served to 105 guests that purchase tickets for the post-reenactment celebration following the outdoor event in the La Harpe Methodist Church's Fellowship Hall. Museum Items: "Here are the items the museum sells to generate revenue."